American Airlines, so called guide! Ask yourself should I book with this company? Or perhaps choose another airline. Almost a full year ago, this article was written. $8 packet will include pillow and blanket starts 1, May, 2010. 12 December 2012 American Airlines cleared for bankruptcy as pilots agree to a tentative contract. AA codeshares with Spanish airline Iberia who have voted to strike this month. For passengers it's really risky flying with this airline, particularly over Thanksgiving, Christmas and New Year. Some of us just don't have the money to throw around in this economy. The thought of being stranded connecting between flights with kids, elderly or disabled is just unacceptable. Plenty of other airlines to choose from who are cashing in with an unexpected bonanza in bookings. Hope a commission is monitoring air prices. 20 October 2012 Not much improvement has gone on here lately. Wall St. Journal calling out AA bosses for not being "sufficiently transparent". CEO being left out of future negotiations and management has asked Judge for more time to organize bankruptcy LA Times has a video up about American Airlines new seating plan on Boeing 777. Business class seat lays flat. Non premium seats 17" wide and first class seats 36" wide. Pilots still don't have a deal. Talks still on going. to JFK. American has 8 jets grounded. Thursday 27 September 5% of flights cancelled. Wednesday 26 September 2012 Today AA pilots protest out side Boston Logan Airport and the State House. Pilots union and management were due to meet today. Airline publishes a 82 million dollar loss for August. Jet Blue has no interest with a merger. Monday 24 September 2012 Most American Airline pilots have flown regulated number of hours for the month of September. Saturday 22 September 2012 Pilot sick out being helped along by flight attendants calling in maintenance problems, such as backed up toilets, slow taxing to the gate, frayed seat belts, broken coffee machines, passenger reading lights. Friday 21 September Another 32 flights canceled at Dallas Fort Worth. 18 September 2012 American canceling flights, Sunday (90) and Monday (57) more than any other airline. Airline has imposed new rules on it's pilots. Outsourcing more flights to other airlines, terminating pilots retirement a program. 22 scrubbed for today. American Airlines pilots strike ballot results will be in Wednesday October 3. No imminent strike threat. It will take weeks before anything like that takes place. (I would buy travel insurance. Once a strike date is made public it is too late to buy insurance.) All policies have different rules and regulations, be diligent. 21 August 2012 American Airlines flight attendants accept new contract. Fear that a future contract will have even more cuts, layoffs of some 2,500 flight attendants. This joins AA mechanics who signed a new contract recently. 11 June 2012 Here's an update as to what's going on with this airline. Pilots calling in sick by the droves. Taking time off for elective surgeries while the co-payes are low. American management is canceling flights in July due to lack of pilots, best confirm your flight. 57 pilots retired in May. 1,400 management and support jobs to be gone by the end of summer. 29 November 2011 Bankrupt. Now what's the unions move? What happens to pensions? Minimal disruptions. Alliance partner. Pilots, management will meet with federal mediator Dec. 6 to tell them how the talks are going! Pilots and management talks stalled two weeks. 25, August, Votes in, contract rejected, 6,074 to 3,371 against, next move is National Mediation Board, who months ago told mechanics to go back to negotiating. Remember if mediation board calls this dispute at an impasse, union/workers still have to do a 30 day cooling off period. Thanksgiving coming up, protect yourself, choose another airline! 5/26 Flight attendant talks with management came to an impasse last Friday. AA have sent out e-mails to managers asking for volunteers if cabin crew strike. No new meetings scheduled. 19, May, 2010 Flight attendants counting strike votes. 15, April, 2010 AA and union representing workers ordered back to mediations talks today. 2, April, 20100 American Airlines told the National Mediation Board that it's making progress in negotiations with two of its unions and should continue mediated contract talks. 11, March, 2010 AA machinist now leave mediation, in 30 day cooling off period. 4, March, 2010 Flight attendants now on a 30 day cooling off period after which they can legally have a strike vote. Expect no word till mid-April from mediation committee. 2/16/10 Ground workers for American Airlines threaten strike. Transport Workers Union will ask federal mediators permission to let employees walk away from mediation talks if no deal is reached by March 8, 2010. If mediators agree, union can strike legally from 30 days on. Only president Obama or Congress can block a strike. 1, Feb. Management thinking about the training of replacement workers in the event of a flight attendants striking. British Airways doing same thing as AA, but a little further along than AA. 1/29/2010 Mechanics and flight attendants are still working without contracts. Talks are still at an impasse with management. 11/17/09 American Airlines flight attendants conduct a simulated strike demonstration, Wednesday, at airports across the country, Dallas, San Diego, Chicago, Washington D.C., Boston, Raleigh-Durham, Miami, San Francisco, West Palm Beach, St. Louis, Newark (NJ), and New York City. In the simulated strike, a select number of American Airlines flights will be designated as "red flights." Flight attendants assigned to these flights will wear a red disc under their union pin with the words "Got Guts" signifying this flight would not be operating if this were a real strike. 14, Oct, 09 Senators urge close scrutiny of Oneworld alliance between American Airlines, British Airways. 9/5/09 American Airlines looking to merge with British Airways. British Airways hanging on by a thread and threaten strikes this Thanksgiving and Christmas holidays 2009. AA by ETR as to what's going on. 12 June, 09 American Airlines will cut about 1,600 jobs, representing 2% of AA workers. Flight attendants will take the biggest hit from NY La Guardia and Chicago. 50 cargo jobs and 40 maintenance workers. Will take delivery of 31 new Boeing 737-800 jets in 2009, up from 29. Next year, it'll take 45 of the new 737-800s, up from 39. Replacing those tatty old MD-80. 2 April, 2009 Things are starting to get nasty. Employees no raise since 03 and executives will get bonuses, stock based. Of course not so much this year as AA lost $2.07 billion last year! $40 per share in early 2007 to less than $3 last month. TWU to take ads out on news sites featuring corporate executives matching name with bonus! TWU is still in mediation, no changes. 3/4/09 Latest. Thousands of American Airlines pilots gathered Tuesday to strategies about work slowdowns and other headaches that they might inflict on airline passengers. 9 Union chapters met country wide, 2,000 pilots in all. No progress with management. 2/25/09 American Airlines pilots, will not strike, but they will disrupt and cause chaos to the airline, if it can't get a new labor contract after 29 months of bargaining! Negotiations have fallen apart, but before a strike can legally occur the federal mediators assigned to making the deal work must declare the talks at a standoff. Parties have been in mediation since June 08. The union hopes that by taking a no-strike stance, it will increase the chances that the National Mediation Board (shall we say threaten board) will declare the talks at a standoff and let the union take less dramatic steps allowed by law. Mediation could go well into 2010 affectingly putting a halt to any strike. Without a release from mediation, any strike action the union takes would be a violation of federal law. Union leaders declined to say exactly what they intend to do except that it will be kept legal as one member said "use your imagination"
Go Slow ie: flight delays, cancellations, no pilot available at this time, slow to leave gate, sick outs, extra long time sitting on runway. You know you've dealt with it. Very inconvenient. Let's get the word out. Don't book with this airline unless you don't have an alternative route or another carrier. Will check in staff be aligned with them? Pilots due to meet up again next week. In a nutshell, short history. 2003 AA went bankrupt, convinced staff pilots, attendants, ground crew to take pay cuts. Airline came out of bankruptcy and never came through with a deal for its staff. In1997 pilots walked off job for 24 minutes till President Bill Clinton stepped in. In 1999 Federal judge fined union $45 million after illegal sickouts canceled 6,000 flights! Unions are bitter and opened these negotiations asking for a 50 percent raise over several years! Can you blame them? AA have not made a counterproposal. Union's leverage is limited by the recession. President Obama's first union problem? 2/26/09 Thursday, American Airlines will. let go 410 junior flight attendants by April 1 if it does not have enough volunteers for early leaves, job sharing and retirements. AA hoping that these incentives will kick in so they don't have to furlough more employees. 2/10/09 American Airlines Unions not happy that the chief executive of American Airlines won't meet with the unions president to discuss contract talks. 28 months of bargaining! Unions looking for AA to make good on the concessions from 2003. Negotiations not working, union may ask federal negotiators to declare an impasse. This could result in a 30 day cooling off period. ultimately followed by a strike. Mediators are still involved in ground crew. 29/1/09 The 300-400 Flight attendants can sigh a sigh of relief tonight, they can keep jobs. Early retirement incentives helped. 12/15/08 Wanted federal mediator for American Airlines and ground workers, flight dispatchers who are represented by the Transport Workers Union. Talks broke down after the two sides failed to agree on pay and benefits. 12/15/08 American Airlines and TWU union representing about 14,000 baggage handlers and other ground workers (cargo handlers, fleet service workers, aircraft part clerks, simulator tech's, ground school and simulator instructors ended talks after the sides failed to reach a contract after almost two weeks of negotiations. 11/21/08 American Airlines flight attendants protested to regarding new contract. They want pay increases to return salaries to 2003 levels when the union gave up wage increases as the airline hovered near bankruptcy. 10/29/08 Beginning Saturday, American Airlines customers traveling domestically or to the Caribbean or Mexico will have the choice of two new sandwich offerings for afternoon snacking: Italian Deli Panini - beef salami and turkey, provolone cheese, lettuce and tomato on panini bread served with a side of Italian herb dressing Roast Beef Ciabatta - roast beef and provolone cheese, lettuce and tomato on ciabatta bread served with a side of horseradish Dijon dressing. A customer favorite, the Asian chicken wrap -- grilled chicken, romaine lettuce, Napa cabbage, red bell peppers and Mandarin orange slices wrapped in a tortilla -- will remain on the menu. The above items are available for $6 each and will be offered on flights lasting three hours or longer and departing after 10 a.m.For customers traveling on flights departing before 10 a.m. and lasting three hours or longer, American Airlines will continue to offer its popular bagel sandwich -- a plain bagel with roasted turkey and mild muenster cheese -- and the breakfast croissant -- a croissant layered with turkey, muenster cheese, lettuce and tomato -- both available for $6 each. 10/7/08 American Airlines considers new price structure...choose your level of discomfort. The AAdvantage partnership with Turkish Airlines will be discontinued effective March 30, 2008. For Turkish Airlines flights taken on/after March 30, 2008, mileage accrual will no longer be offered. 9/10/08 American Airlines resumes non stop flights from Miami to Antigua after 10 years. 9/10/08 Grounding are older generation planes," Horton said. "They burn 35 percent more fuel per seat than the new generation planes. So, when you ground those planes, it would be very difficult to bring them back, not just in operations cost but also in maintenance infrastructure." 9/10/08 US airlines not planning to cut fuel surcharges. 8/15/08 WASHINGTON -- Attempting to stem a national furor, American Airlines announced that it would stop charging extra-luggage fees for active military personnel. Now a Tampa Bay area congressman wants to ensure that other airlines put an end to the practice. 8/8/08 frequent fliers on American Airlines Inc. got hit with another round of fees on Thursday – this time to upgrade discounted economy class tickets to the business and first class cabin. 14 July 08 The Allied Pilots Association (APA), which represents the 12,000 pilots of American Airlines (NYSE:AMR), has held what it called a "strike preparedness summit"
9 July 08, Here we go again, recall on MD-80's. 2 July 08 American Airlines confirmed Wednesday it sent a "WARN" letter to its 900 most junior flight attendants, advising them they are subject to furlough effective Aug. 31. 6/26/08 American Airlines officials have told employees that the carrier expects to cut about 8 percent of management and support jobs at the nation's biggest airline as it copes with record high jet fuel prices. 25 June 08 American Airlines to test in-flight Wi-Fi service, The in-flight service, dubbed "Gogo," was developed by AirCell and installed on 15 of American’s Boeing 767-200 jets. It will be available Wednesday to customers flying from John F. Kennedy Airport in New York to Los Angeles, San Francisco and Miami. American will begin a broader test offering of the service, which will priced at $12.95 for flights longer than three hours, and $9.95 for shorter flights. 5 June 08 American Airlines new $15 fee for first checked bag will affect fewer than one in four customers and won't lengthen lines at boarding gates. Members of the elite levels of American's frequent flyer program won't have to pay the fee, and neither will those who bought full-fare tickets or are traveling overseas. 4 June 08, Woman suing American Airline over peanut allergy. 5/28/08 American Airlines says pilot contract would boost costs $3B a year. The airline, whose parent, AMR Corp., lost over $300 million in the first quarter this year, says passengers on those cancelled flights can get a full refund, apply the value of their tickets toward future travel, or rebook without a fee. AMR's CEO Gerard Arpey has said that the airline will contract with an independent third party to review compliance "with all future FAA airworthiness directives." Shares of AMR were down 11% on Wednesday. 3/29/08 Historic day, Open Skies agreement starts today. AA lands in troubled Heathrow. We've been told that American has offered pay protection to pilots on flights that were cancelled today because of the MD-80 inspections. That basically means that they can still receive their pay if they were scheduled to fly one of those segments that was canceled. As of yesterday afternoon, 200 planes had been inspected and 80 were found to need modification, the airline said. *AA, Pilots, Feb.14 strike deadline. Would cost the U.S. economy nearly $4.8 billion if it lasts two months, Major repercussions involved. 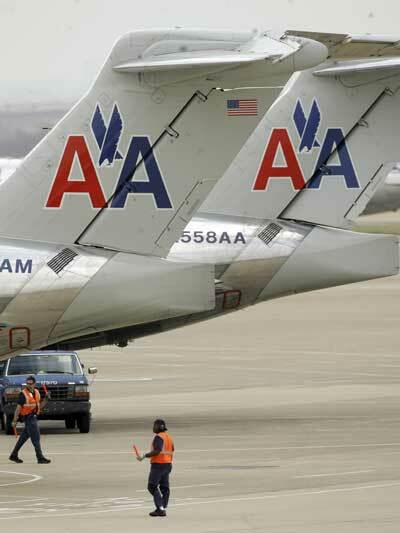 AA gives workers $67 million, $800 to American employees and $500 to Eagle. Professional Flight Attendants called the payments "too little, too late." A start to repaying employees for pay cuts and other concessions they made in 2003. 3 American Jets get installed anti-missile. Will fly from California - NY. Mounted on the belly of the plane, between the wheels. The device works with sensors, mounted on the plane, that detect a heat-seeking missile and shoot a laser at it to send the missile veering harmlessly off course. American trims flights as pilots plan retirements. American Airlines is canceling dozens of flights in its February schedule as it faces potential retirements of more than 100 pilots, company and pilots union representatives said Wednesday. American executives said the flight cancellations are unavoidable, necessitated by an early retirement option for senior pilots and a downturn in the stock market. Pilots, you know this is going to happen for the holidays. I was wrong! Whose on strike today? Shaky Airline Status​ Is your airline reliable? On non-stop flights from NY-LA, NY-Miami, NY-San Francisco, Internet using laptops, smart phones and PDAs. fee of $12.95. In June, Internet service on 15 American Airlines Boeing 767 aircraft. You put a instant messaging icon on your laptop, speed is as fast as DSL. Would be nice if American Airlines rented out some laptops whilst on board. 8/09 Wi-Fi service is now available on 100 MD-80 aircraft and15 Boeing 767-200 by Gogo high-speed. John Conley, Transport Workers Union TWU's air transport division director. Represents 25,000 workers over 7 sectors. American Airlines strike, threat, expect flight disruptions, pilots, flight attendants layoffs, go slow, unions, review, travel guide, executive bonuses, chaos, sick days, financial health, and industrial disputes. Finally will they strike after I've bought my ticket! American Airlines, the world’s biggest carrier measured by traffic volumes, accounts for barely 7 per cent of world capacity. 73,000 employees. Arbitration club, AA pilots, flight attendants, mechanics, ground crews, airport agents. Don't just stop here - see who else is on strike today and going to mess with your travel plans!